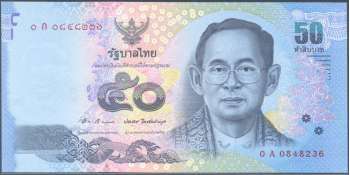 According to a press release dated 12 January 2012, Governor Prasarn Trairatvorakul announced that the Bank of Thailand is issuing a new family (series 16) of banknotes designed to glorify Thai kings of different periods. The notes will feature "new advanced counterfeit deterrent features," but will retain the sizes, colors, and denominations of the current series. 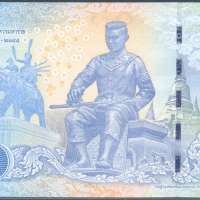 The notes will be issued over several years, beginning with the 50-baht denomination issued on 18 January 2012, the date commemorating the glorious victory of King Naresuan the Great in traditional royal combat on elephant back in 1593. 50 baht, no date. Blue. Obverse: Royal Garuda emblem; King Rama IX wearing in the Royal House of Chakri gown. Reverse: Royal Garuda emblem; King Naresuan leading soldiers up ladders to attack Burmese camp; statue of Somdet Phra Naresuan Maharaj, modeled from the monument at Don Chedi Suphan Buri Province; statue of seated King Naresuan pouring water on the ground, symbolizing the declaration of independence; Phra Chedi Chai Mongkol located at Wat Yai Chai Mongkol, Phara Nakhon Si Ayutthaya Province. Windowed security thread with demetalized text.